With the usual routine that entwined in our lives everyday, spending 2 to 4 hours to get those me-time around is more on taking care of ourselves making us later a better person. 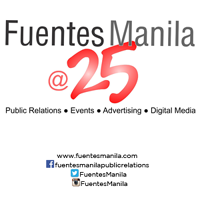 This is my shout out in my Social Media account after half-day work with client last Holy Wednesday – #MeTime, its really about time as I feel those stress is now bound to creep me in. For almost months of monitoring and doing implem work, my only time was a quick vacation in a weekend or having a time to face other projects. Noticed that my pedicure already chip-off as I didn’t mind because I always wear my closed shoes anyway. But because we had an activity in Subic that kept my feet dirty doing some run, aside from the needed pedicure, a foot spa or massage is badly needed. Since I was already in the metro, I maximize my time to do some pampering senna. Together with hubby which was hard for me to invite for both of us to have a treatment, finally I convinced him to join not only to take pictures but also bonding moments for both of us at Luxe Nail and Face Studio. 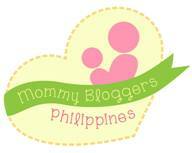 This is really seldom and taking those opportunities for both of us are a must for a married couple. One-on-one I may say. I thought we will be the only persons for a Holy Wednesday afternoon to avail foot spa treatment. Surprisingly, there were customers they accommodated. 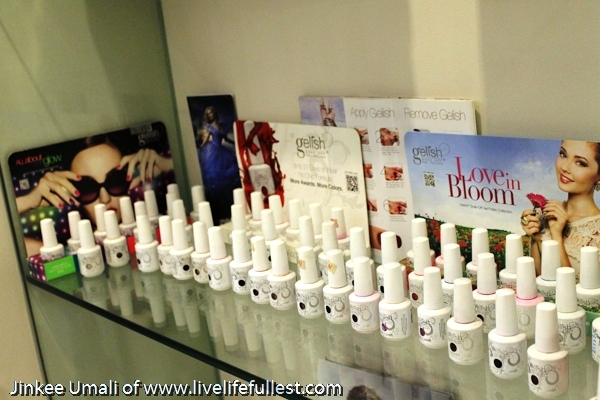 What we did was to have a facial care treatment called Classic European Facial, price is P 600.00. Starts with deeply cleaning that exfoliates the dead surface skin. 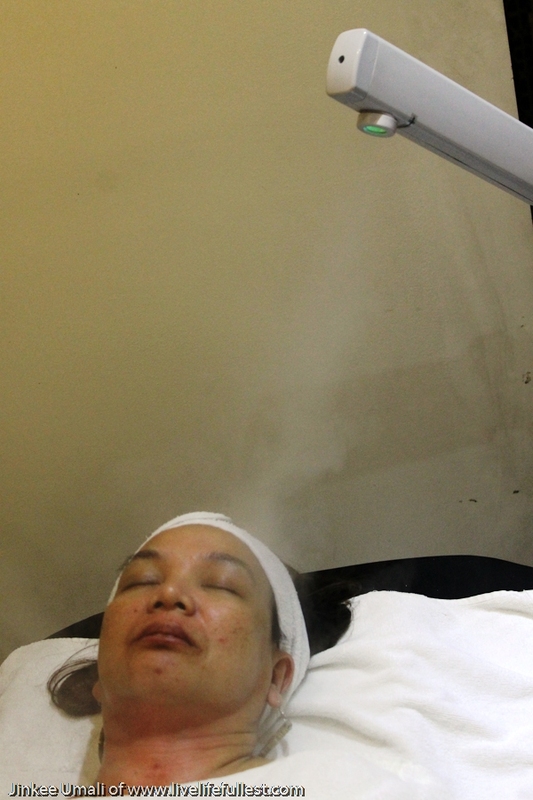 It follows with steaming to open the pores and disinfects the skin. After that, a massage of the face, neck and shoulders to stimulate the aura. As I went around, their foot massage area got those elegant experience with tranquil vibe of black couches that will not dismay to male customers like hubby to come in. Some of the salon got those pink, lavender, red or other pastel color combination – girly whimsical themed mecca that maybe some of the reasons why sometimes hubby just leave me even I invited him. Tucked with a hue of white and black around, their relaxing interiors are such an indulgence one cannot resist for the me-time acquaintance especially there are stacks of local / foreign magazines and soothing music one can calm down. 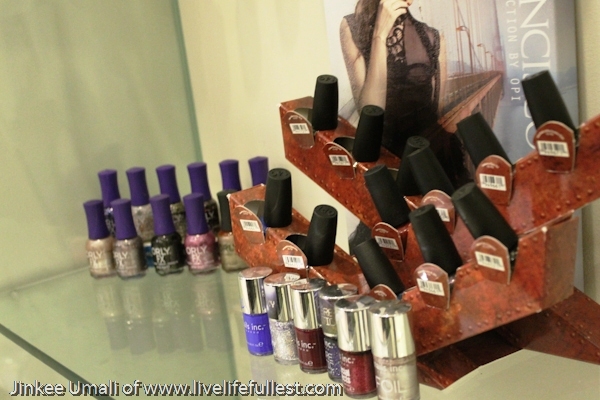 They use also quality nail lacquers like Essie, OPI, Orly and Zoya with a wide selections of colors to choose from. 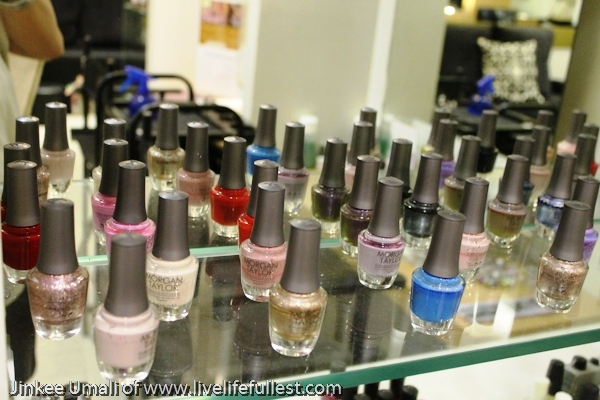 Aside from the regular mani / pedi, they also offer Gel Polish services that stay on nails up to 3 weeks with no chipping or peeling even one does household chores like laundry. It cures in LED lamp in 30 seconds. And now its time for the foot spa. Did you know that the most pampered parts of my body would always be my feet. I always took really the time to take care of my feet eversince. Not only the nails but also the feet itself. You will never see me washed my feet when I felt it was fully used up like walking, running or hiking. It has to be rested before I do the cleaning but after I massage it. 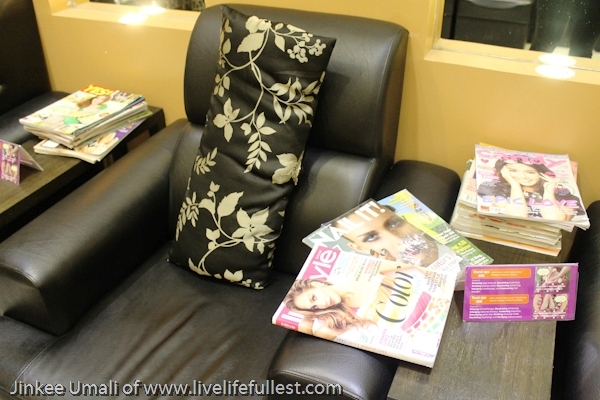 Maybe this was the main reason with my visit to Luxe Salon – a sanctuary of relaxation that would give my feet a needed attention that would soothe an afternoon of rubdown and massage. For P 650.00, the relaxing aromatherapy Foot Spa based treatment consist of foot soak, exfoliation and moisturizing of the lower legs and feet, exhilarating masque infused with lavender and peppermint oils together with the 8-plate ingredients that they offer that includes already a pedi and polish. Meticulous yet very precise that aside from those applications, they have also 8 steps in doing foot spa that made the treatment extraordinary. It is not the usual foot clean like scrubbing, soaking, massage and put oil at the end. 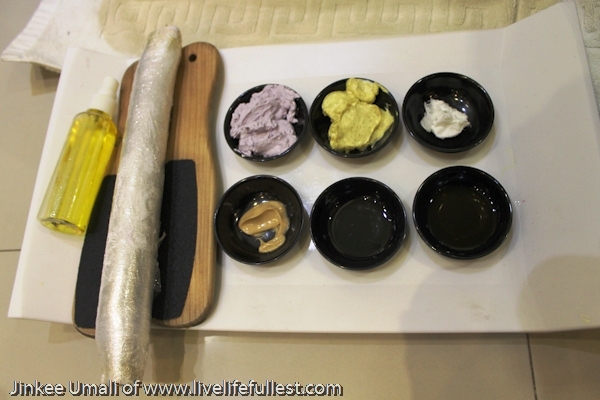 It is more on mask / wrap up, hydrating and moisturizing that made those feet pampered all throughout the session. There were times after my facial, result of reddish effect all over my face and swollen area especially those that has pimples, blackheads or whiteheads because of thorough pricking just to removed them. 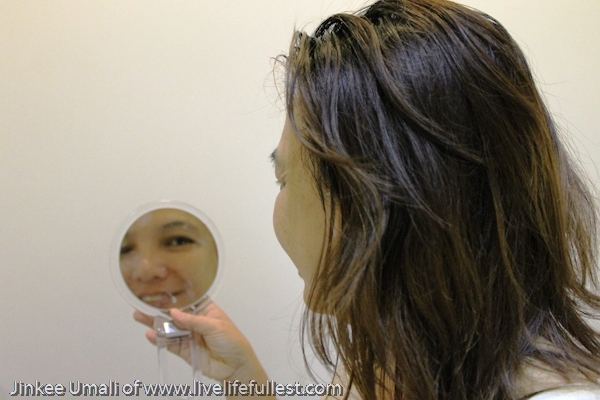 Those decadent facial mask that put my face left my skin smooth, silky and soft. It gave the natural moisture that led not only romantic smelling but also remove those dead skin cells and surface dirt. While my hands and especially my foot are now ready again for the next adventure, the painstakingly process of doing those foot spa finally got the needed coddle and therapeutic caress. These left a soft yet loosen up feeling not only to my feet but totality of what I feel. 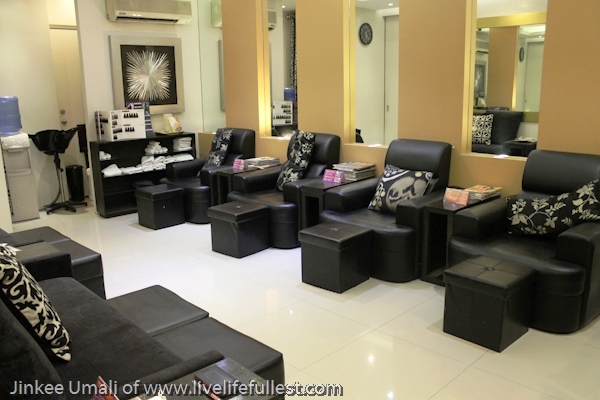 Overall, Luxe Aura Nail and Face Salon laze intimate interior with cozy couches are some of the best me-time experiences aside from the therapists that are accommodating and professionally trained. The free strong WiFi connection all around the area which made me also worked and read a selection of good magazines get those extra credits to make this afternoon a delightful yet amusing own enjoyment. Still at the end, with the usual routine that entwined in our lives everyday, spending 2 to 4 hours finding time to get those me-time around is more on taking care of ourselves making us later a better person. One secret that I asked hubby when we were still dating were good impressions she look in a girl. Well according to him, aside from the face, he really took time to check the whole feet and stared with the sole for a long time. If he finds it soo clean, this girl really takes care of herself. 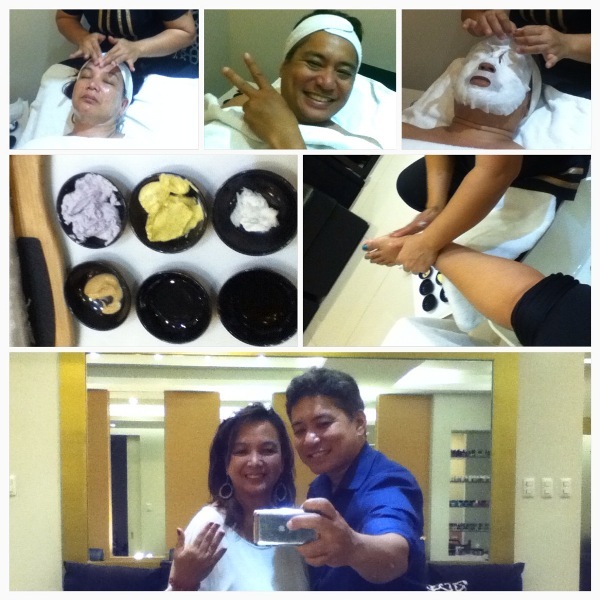 Finally, have encourage hubby @rlgumali to do it with me, that #MeTime – facial, hand and foot spa at Luxe Aura Salon. Usually, he just wait for me. This is a chance also for us for one-on-one convo which is a must in married life.